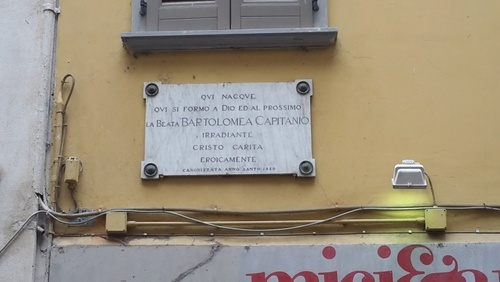 This memorial tablet, located in Lovere (via Antonio Gramsci), commemorates the birthplace of saint Bartolomea Capitanio. She founded the "Ospedale per Infermi Cronici e Miserabili" in Lovere with saint Vincenza Gerosa in 1826. Bartolomea Capitanio was blessed in 1926, whereas Vincenza Gerosa in 1933. They were recognised as saints in 1950. The currently operating hospital "SS. 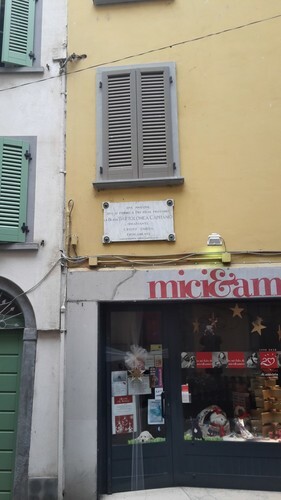 Capitanio e Gerosa" in Lovere is entitled to the two saints.